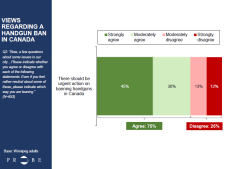 Most people in Winnipeg agree that there is an urgent need to take action on banning handguns, according to a poll that found only 25 per cent of city residents disagree with such a ban. Michael Weinrath, criminologist at the University of Winnipeg, said the findings aren’t surprising. 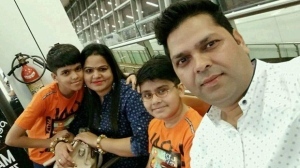 The federal government is looking at a possible ban on handguns and assault weapons in the wake of a number of fatal incidents, including a mass shooting in Toronto in July that killed two and injured 13 others. Border Security Minister Bill Blair announced a public consultation Thursday that Canadians can contribute to online. 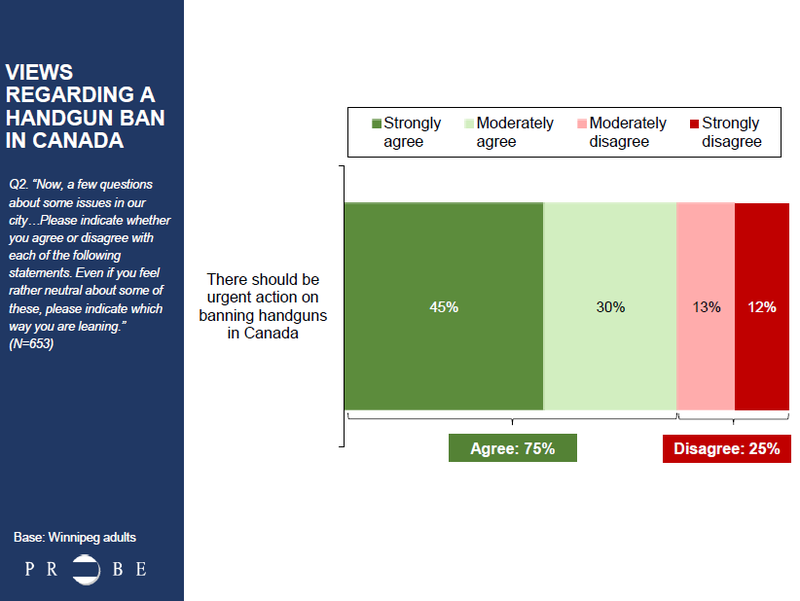 The poll of 653 Winnipeg residents on the issue, conducted by Probe Research with CTV Winnipeg and the Winnipeg Free Press between Sept. 19 and 28, found women and older adults are far more likely to support a ban on handguns than men. Weinrath said women are less likely to own handguns and may see ways such a ban could directly benefit them. “Spousal homicide is disproportionately, for example, directed against woman,” said Weinrath. 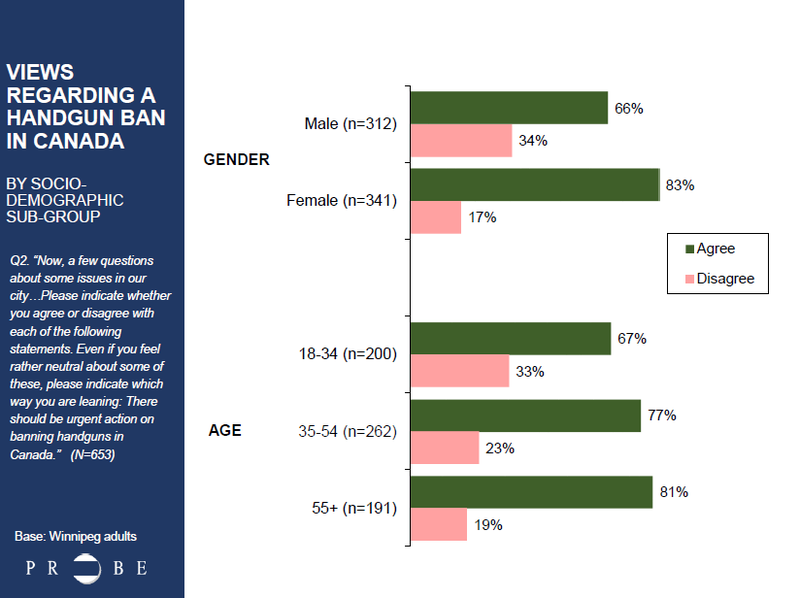 He said while the numbers suggesting adults age 55 and older are more likely to support a ban was less expected, there are factors to support why they’d be in favour. Weinrath said handgun ownership has increased in Canada, as have gun deaths, but gun owners may not be directly to blame for the uptick in gun violence. “When we started looking at it, a lot of the bump in firearm related homicides is associated with gang membership or involvement in a criminal subculture,” he said. Weinrath says fewer handguns overall means fewer handguns available for violent criminals to steal. But gun owners disagree that banning guns would have that kind of impact. 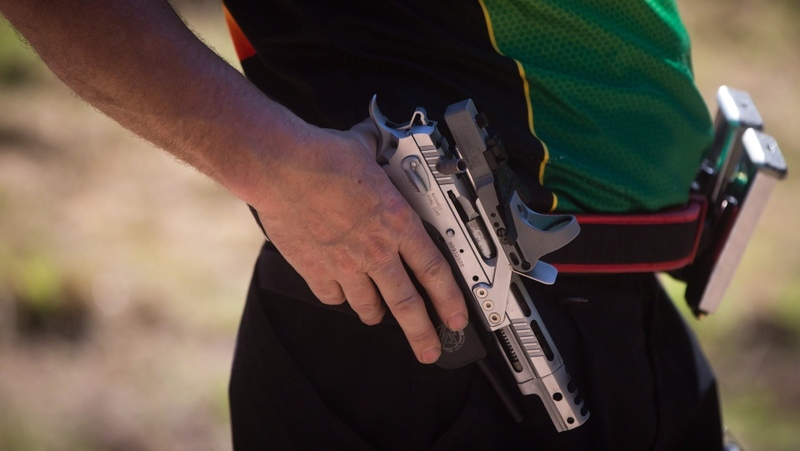 "I don't think most of the handguns that are used in crime and most of the guns in particular that are used in crime have anything to do with us, the legal owners," said Brenden Roemich, president of the Winnipeg Revolver and Pistol Association. Instead Brenden Roemich says it would punish people like him and his members. "We're sportsmen, so it's a sport, a ban on handguns would be kind of like a ban on golf clubs for people that golf," said Roemich. Winnipeg's two mayoral frontrunners appear open to the idea. "If that review results in a total ban or however they want to structure it, if it's going to help remove guns off the streets, absolutely we should be supporting that," said Brian Bowman, referring to what's taking place federally. "I know that we need to do everything that we can, so I would be very happy to consider that as an option," said Jenny Motkaluk. The Probe Research poll had a margin of error of plus or minus 3.8 percentage points, 95 per cent of the time. Respondents were recruited to complete an online survey through wireless and landline phone numbers. The margin of error is greater with demographic subgroups.